Skin Yard songs: "Throb," "The Birds"
The very first Skin Yard recordings to appear were on this compilation record, released on vinyl (shown upper left) in 1986 by Chris Hanzsek, a producer/entrepreneur who had moved to Seattle a few years previously and been quite taken with the local music scene. (His earlier recordings included the first Green River and Accused EPs.) He and his partner Tina Casale decided to start an indy label, C/Z Records, and put out this record as the first release. 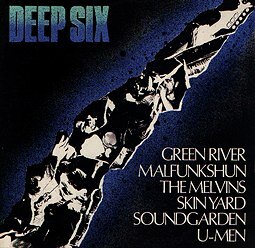 The bands included Soundgarden (with Scott Sundquist drumming), Green River (with Mark Arm, Jeff Ament, Stone Gossard), Skin Yard (with Matt Cameron drumming), Melvins (Buzz, Dale and Matt Lukin), Malfunkshun (with Andy Wood) and the U-Men (with Tom Price, now in Gas Huffer). 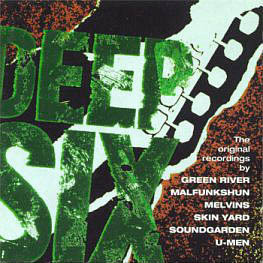 For all the bands except Green River and U-Men, this was their first release and first time in a recording studio. Vinyl copies of this are quite rare and fetch a high price with collectors; A&M Records reissued it on CD some years later (shown below left), but gave it zero promotion and so it quickly vanished. After doing a Melvins 7 inch EP (CZ-002), Chris tired of losing money and basically gave the label to Daniel and Jack of Skin Yard, preferring to concentrate his efforts on his recording studio, Reciprocal Recording. Daniel and Jack put out the first Skin Yard LP (CZ-003) and single (CZ-004); Daniel put out the My Eye 7 inch (CZ-005); Jack put out the Secretions comp (CZ-006); and thereafter, Daniel got serious about running the label and C/Z became his baby. For many people, the two Skin yard songs here ("Throb" and "The Birds") are the only Skin Yard they have ever heard... a fact which has caused us great chagrin ever since, since they can only be called "embryonic" versions of our sound... at best. These versions can not even be said to "rock" in any sense of the word; they are slow, drony and semi-psychedelic, and were pretty out of place on this record. Both songs were later re-recorded: "The Birds" as a bonus track on the CD of the first Skin Yard CD, and "Throb" for Hallowed Ground. Original cover art (at top above) © 1986 by Reyza Sageb. 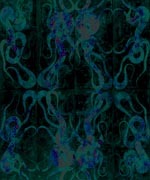 The CD reissue cover art shown below it is actually just a redone "homage" to the original cover design. Ben McMillan: vocals; sax on "Birds". Some Skin Yard band photos are in Jack's Photo Album.